Catering to both couples and families’ unique vacation needs, Grand Memories Splash Punta Cana offers access to an abundance of accommodation options with high-quality amenities. Relax in one of the spacious and brightly decorated junior suites or suites, offering exceptional amenities like, 24-hour room service, a balcony or terrace with exciting views, stocked mini-bar and more. Indulge in an array of gourmet dining options ranging from casual to formal. Kids and teens can play exciting games at the kids club, enjoy unlimited access to one of the largest on-site water parks in the Caribbean, or enjoy non-stop activities and non-motorized sports at the ‘Hang Out’ teens Lounge. Stay Active while on vacation and enjoy the tennis court and the gym which gives guest the option to request a fitness instructor at no additional cost. Get renewed at the royal spa with a full-range of massage, body and facial treatments, ensuring guest are refreshed and ready to enjoy the rest of their vacation. 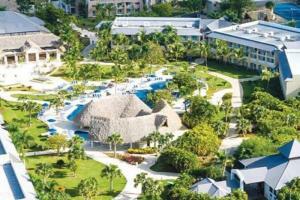 Located approximately 16 miles from the Punta Cana airport.